I remember when the Oak Park Borders opened. On the corner of Lake and Harlem, it occupies the same building that once housed Marshall Field’s, back when my mom worked in the loop and rode the Green Line from Oak Park. I didn’t know it then, of course. By the time I moved to the village with my family, the building was home to a Chernin’s Shoe Outlet, where they had pretty current styles but you had to hunt for the box with your size, yourself. I was a little apprehensive about Borders’ opening. We had a Barbara’s in town, just at the other end of the block, as well as the Book Table, an independent book store that specialized in discount books, new and used. I was a Barbara’s loyalist and had spent many an afternoon in one of the cozy nooks perusing a stack of books. I’d usually buy one or two, or a magazine. They had a good number of literary magazines. But Borders was so dang convenient. They had a huge stock – even movies! Even music! And their magazine section was very large. And let’s face it, the cafe (once the new employees learned how to reliably make lattes and cappucinos) with its big comfy chairs and cookies (heated up in the microwave) was awfully alluring. My husband and I would wander over there like we used to go the mall in high school – to hang out. And so Borders drove out Barbara’s. For a long time, I made the commitment to buy one thing in Barbara’s for every one item I bought in Borders. And then that got a little silly and I felt stupid going into Barbara’s with my Borders bag. And now they’re gone. The death knell has rung for Borders now. I was just in there, spending $40 for $125 worth of stuff, including several books I wouldn’t ordinarily have purchased and two packages of party napkins that might be good for decoupaging onto paper mache balls. The books are terribly picked over and they have about a thousand faux sheepskin “throws,” which the up-and-running Borders never sold but for some reason, now that they’re going out of business, they have them stacked to the ceilings. The DVDs are picked over, too, except for the Blu-Rays, which are still behind lock and key and it’s probably too much trouble for the customers to go find a clerk in order to make a purchase. The fixtures are for sale – a great deal can be had on gigantic blondish-wood bookcases. Three for $100. The staff look harried and are probably worried, as they likely should be, since they’ll be out of work soon. I did my part to hasten their unemployment, getting most of my books from Amazon (free shipping for paper books and “Whispernet” for Kindle books), my music from iTunes and my movies from Xpedia On Demand. Thank heavens I still subscribe to the Chicago Tribune and the New York Times (as well as a good half a dozen magazines), or my guilty feelings would be almost overwhelming. My world’s in danger of becoming like being on vacation in Honolulu or Las Vegas, but without the great weather or gambling: a tough place to find a book. I work just off Michigan Avenue and we used to have a giant Borders. It’s going to be a Topshop. I have no idea where there is another bookstore within walking distance… rumor has a Barnes and Noble somewhere off thataway. I’ll try to find it. And I have vowed to frequent the Book Table. 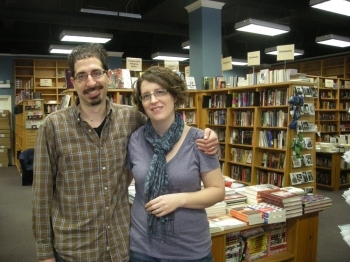 Rachel Weaver and Jason Smith are committed to Oak Park and to readers everywhere. I salute them. 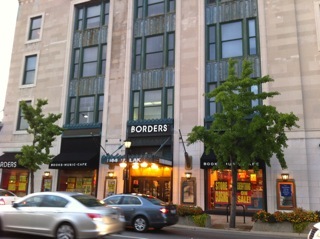 You can read more about what they had to say about Borders’ closing here. This entry was posted in Commentary and tagged bankruptcy, Barbara's Bookstore, Borders closing, IL, Oak Park, The Book Table. Bookmark the permalink.